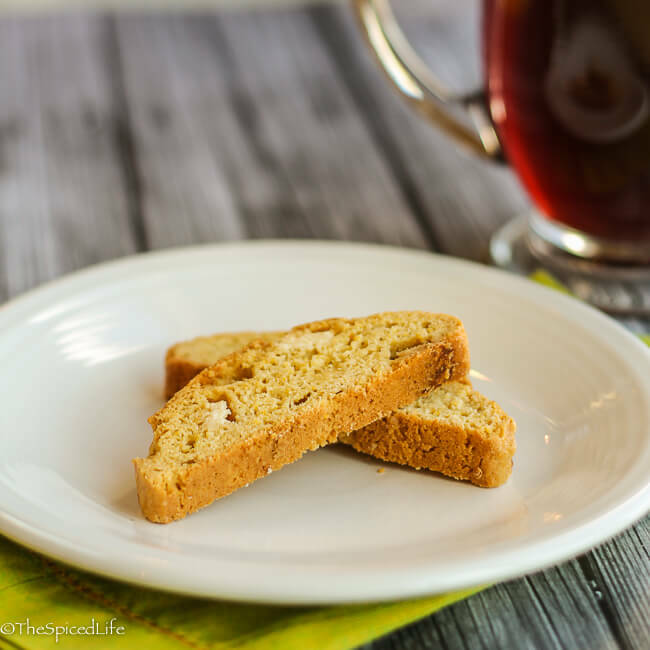 Citrus Olive Oil Biscotti with White Chocolate Chunks are the perfect after dinner pick me up; orange, lemon and anise evoke the flavors of islands in the Mediterranean. Keep reading for other great cookies with white chocolate! I was provided a copy of Ciao Biscotti by the publishers in exchange for an honest review, Affiliate links have been used to link to items I am discussing in this post. The Stracciatella recipe I made almost exactly as written. I reversed the almond extract and the vanilla extract amounts just because I am not the world’s biggest fan of almond extract. The biscotti baked up like a dream and were loved by everyone at the read-in. The next recipe I chose I fiddled with, and while the results were delicious, I confess I am not used to cookie recipes where a couple tablespoons of an extract or liquor can throw it off so much. So my problems were my fault, but if you buy the book (and I hope you do–if you like biscotti it has tons of fantastic ideas!) just know that this is one recipe that needs to be made as written. Or make it as I wrote it below, which turned out to be considerably adapted, because when I used Ouzo in place of aniseed, that extra two tablespoons of liquid made the dough into darn near a cake batter! And according to Domenica–whom I asked about why my dough was so very sticky and wet–she said sliced almonds will help firm up a dough (I had replaced them with white chocolate chunks). Who knew? I just always considered nuts–of any shape–to be just another mix in, like dried fruit or chocolate chips. So to make a long story (somewhat) short, I used Ouzo and white chocolate chunks in place of aniseed and sliced almonds, and that then necessitated other changes. I don’t regret it though. These cookies are fantastic. The Ouzo worked perfectly with the citrus, and the white chocolate complements the orange and lemon beautifully. I would be curious to see what adding lime would do, but I was trying to stay true to the Mediterranean spirit of the cookies. Speaking of the primary way I did not stay true to the Mediterranean spirit, white chocolate is this month’s theme for Creative Cookie Exchange. 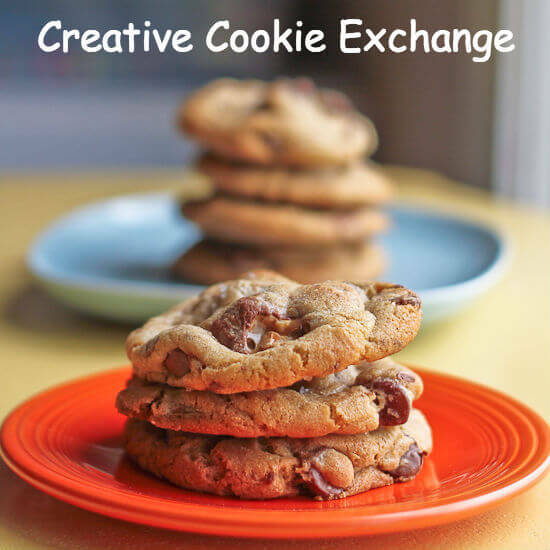 I really encourage you to check out the awesome cookies we have down below. So many people assume that because they dislike eating plain white chocolate that they hate white chocolate. To me it is like saying because you do not want to eat a bowl of buttercream frosting, or plain sugar, or other extremely sweet ingredients, that there is no value in baking (or cooking when appropriate) with them. Nothing could be further from the truth! These cookies do not taste like white chocolate; rather they taste like Citrus Olive Oil Biscotti with tiny bursts of creamy sweetness in the middle. As always, I highly encourage you to use real white chocolate–not those dreadful vanilla baking chips. If cocoa butter is not an ingredient in the white chocolate, move on and try a new one. Despite what I just said about the cookies not tasting like white chocolate, true white chocolate adds a subtle rich depth to the cookies that vanilla flavored shortening could never mimic. Place the first 5 ingredients into a mixer bowl (begin with the smaller amount of flour) and mix on the lowest speed for 10-20 seconds to blend. Add the orange and lemon zest and mix again briefly. With the motor running on low, drizzle the olive oil, lemon oil and Ouzo into into the bowl. Lightly beat 2 eggs and 1 egg yolk. Add the eggs to the mixture and beat on medium speed until well combined. If the dough still seems more like a very thick batter, sprinkle in the remaining flour and mix briefly on medium speed to incorporate. Then mix in the white chocolate. Press plastic wrap tightly against the dough and place in the fridge to chill (this will help to firm the dough) for at least 25 minutes (I did an hour). When you are ready to bake, preheat the oven to 350 F. Line a cookie sheet with parchment paper or a silicone mat. Remove the dough from the fridge. Get your hands a little damp. Divide the dough in half--because the dough was still sticky for me, I quickly worked with my hands only, shaping the dough into a cohesive, fat log. Then place that log length-wise on one side of the cookie sheet and use your hands to pat and stretch the dough into a log 2 1/2 inches wide and 12 inches long. Repeat with the remaining dough on the other side (still length-wise) of the cookie sheet. Brush the remaining egg white over the tops of the logs (you will have some egg white leftover--just discard). Bake for 25 minutes, or until the logs are browned, set and slightly springy to the touch. You should expect to see cracks in the top. Let the logs cool completely. When you are ready to bake, preheat the oven to 300 F.
Remove the logs carefully to a cutting board. Using a serrated bread knife, carefully slice the biscotti width-wise, 3/4 inch thick slices. 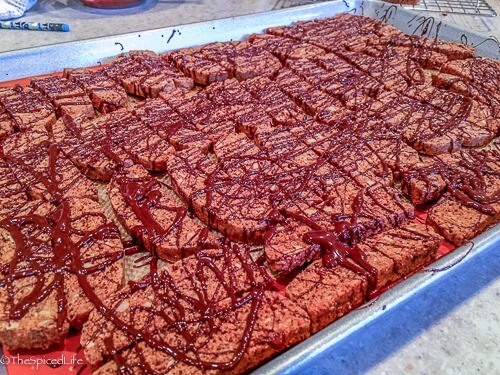 If possible (do not fret if not, but you may need 2 cookie sheets to accommodate the slices if not) place the biscotti upright onto the cookie sheet. This way you do not need to turn them over halfway through. Bake for 30 minutes (if you needed to lay the biscotti flat, turn them over halfway through). Let biscotti cool completely before serving or storing. Very nice biscotti! And now I need to try Ouzo too. I love the sound of the citrus/white chocolate combo in these! What a perfect coffee dunker they are. I love the flavors in this biscotti. Citrus and white chocolate isn’t a flavor I have done before, but now I am thinking why did I never think of that!! I think your cookies turned out excellent. I am newly converted to the love of biscotti, Laura, so I’ll definitely be trying these! I’ve never used olive oil in a cookie or biscotti before. This combination sounds interesting, hope to try these pretty soon. I love biscotti. These look so good. I am in awe of your blog. The design, features, comments, follows, etc. I hope to get to this level of achievement some day! These look so delicious…great photos! I admit that I am a biscotti fan and a citrus fan, so the two together look mesmerizing. Thank you, too, for the tips regarding the recipe. Great info! I usually think of biscotti along side a coffee but I think these flavors would go so nicely with my afternoon cup of tea. Love the citrus element with the white chocolate. My sentiments about sometimes temperamental biscotti dough, Laura, are the same. Yet if the end result is tasty and to your liking why not experiment? And your cookies – as always – look like they are ready for their close-up in Saveur magazine! 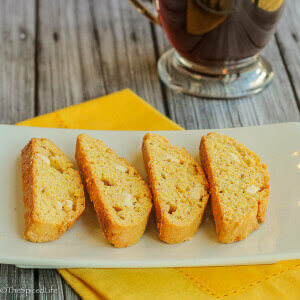 Love the citrus flavor and color of these biscotti, sounds delicious! Those look wonderful Laura, even after all of your trials and tribulations. I do remember Ouzo from college (tee hee). I’ve never tried my own biscotti. clearly that needs to change. These look wonderful, and I definitely need that book. Biscotti is one of my favorite things to make! 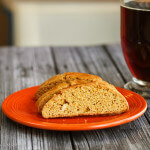 This biscotti looks delicious! I’m also not a huge fan of almond extract. I tend to avoid it most of the time. I bet the citrus adds a wonderful pop of brightness. I love making biscotti! You can do so much with it, flavor-wise. This is a unique combo, I like it! 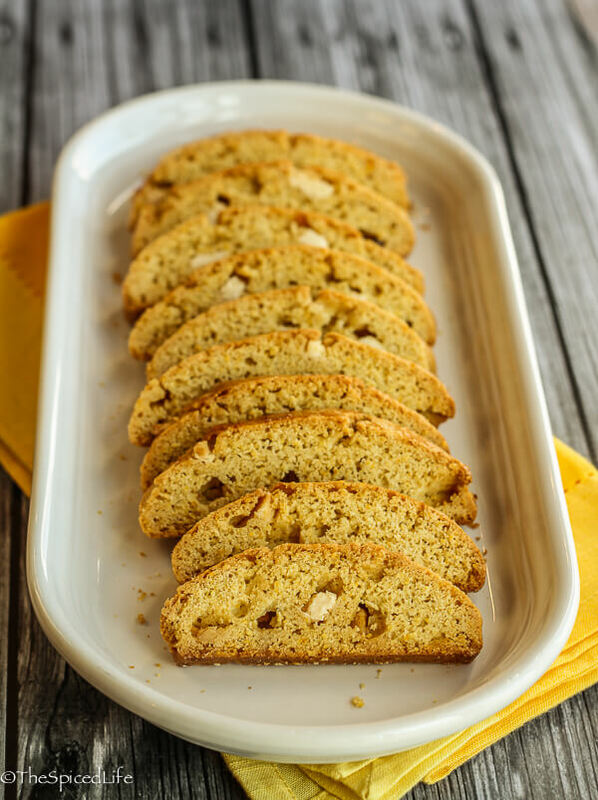 I love Biscotti, anytime of the day… It’s a must try recipe for me…..
Great tips about the nuts – I thought they were just filler too! Such interesting flavors in this biscotti. I usually make biscotti around the holidays but I certainly should make it more often since I enjoy dipping it in my coffee. This recipe has me intrigued and I’m bookmarking it to try later. I’ve bookmarked this for sure. They sound fabulous and I love citrus in biscuits and with white chocolate thrown into the mi – wow! White chocolate with citrus, I’ve never thought of this combination before and now I definitely want to try it. These biscotti look perfect!